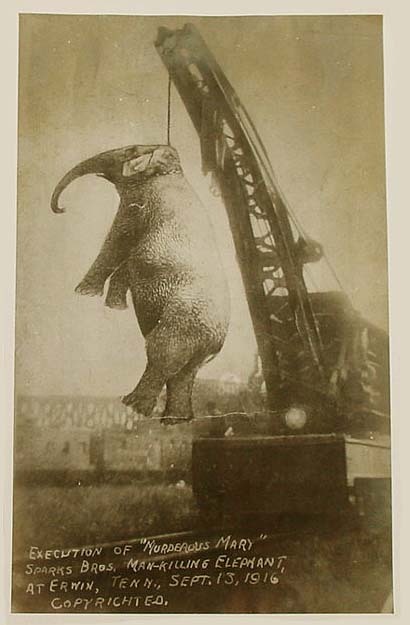 This entry was posted on June 7, 2011 at 8:34 am and is filed under Photography with tags 1916, elephant, execution, hanging, hung, murderous mary, september 13, sparks brothers. You can follow any responses to this entry through the RSS 2.0 feed. You can leave a response, or trackback from your own site. Wow. I have never heard about this before now. So crazy and terrible. A sad sad thing. Humans aren’t fit to have or be in control of beautiful animals. They want to capture them….make them do their bidding…….and if they don’t……they hurt them or kill them. Makes me cry.